Beautiful pastel colours with traditional flair. You can almost taste the strawberries and cream! 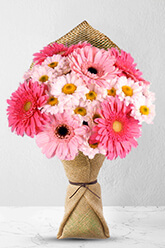 This bouquet is perfect to send on any occasion! Add a vase to this bouquet to make it even more stunning.Vase not included however; make your loved one extra happy by including a Standard Vase to your delivery. Everything was so easy...product selection to delivery advice. thanks! Quick, easy and great service! Well priced, delivered on time - everyone happy.